Jo, I have been playing the free medihv heroic Antrim pala (Only missing ragnaros lightlord). Now I used to play otk murloc paladin a lot so I know how to play it well enough. Trouble is I've been at it now everyday since the wing released and haven't been able to defeat it. Even restarting for perfect hand and the boss' slowest opening yields no clear results. 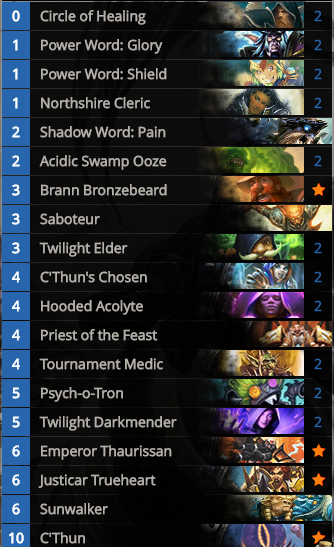 My main question is: are there any other deck recipes for heroic free medihv? You could try N'Zoth paladin if murloc pally doesn't work for you. After you win against Nazra and Malchezaar casts Twisting Nether, you play N'Zoth, the Corruptor to regain board and win easily. It might be worth checking out the deck I posted in the guide comments of that guide. Someone seemed to use it and do well with it, since they couldn't use the Paladin deck. Will link it here. Awesome. If you want advice on cards you don't have or whatever, just let me know. Basically just stall until C'thun is buffed and reduced with Brann, then transition and 1 shot.